Simple Living Air Fryer or deep fryer if you prefer! Line a baking tray with tinfoil and set aside. Slice your pickles into quarters, stem to stem. Set aside. Combine the milk and egg into a shallow dish. Set aside. Combine the flour, bread crumbs, mustard powder, salt and pepper in a second shallow dish and adjust to taste. Dip each pickle into the milk and egg mixture and then into the flour mixture, turning to coat completely. 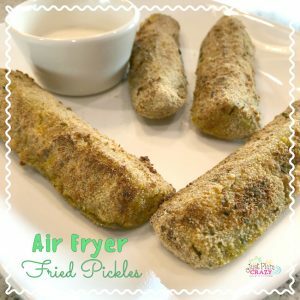 Line Air Fryer with parchment paper and place coated pickles inside. Spritz with Olive Oil lightly on both sides. Air Fry for 5 minutes then flip over for another 5 minutes. Serve immediately with blue cheese, ranch, chipotle ranch or your favorite dipping sauce. Place the breaded pickles on your baking tray and repeat with all pickles. Freeze for 20 minutes or overnight. Remove the pickles from the freezer and carefully place 6 at a time in the oil, turning once to ensure both sides are completely golden brown. Remove to a paper-lined plate and repeat with all pickles.